I had intended to write about why so many peace projects — Oslo, the treaty with Egypt, improving relations with Turkey, etc. — have foundered on the rocks of Arab and Muslim hatred for Jews and Israel. I had planned to illustrate it with Mr. Angry Arab’s remark, as well as the video of Egyptian celebrities exploding in paroxysms of rage in the presence of pretend ‘Israelis’. But the more I looked at Abu Khalil’s remarks, the more I realized that I agree with him about so many things! I thought it would be interesting to point this out. Not Israel — he hates it and hates Zionism. I’m a Zionist and I love Israel. So we have an issue there. Can an Israeli redeem himself/herself? I am often asked that question since I adhere to boycott of all things Israeli. The answer is yes provided 1) the person refuses to serve in the Army or the intelligence service of the state as part of military service; 2) the person must leave the house he/she occupies and the land on which he/she stands on because chances are the house is occupied, in the literal sense, and the land is occupied, in the literal sense; 3) the person must engage in armed struggle against the terrorist state of Israel. If an Israeli person fulfills those conditions, he/she should be acceptable from a pro-Palestinian point of view. He often refers to “terrorist Israel” and repeats Palestinian folktales about the “Jenin massacre” and the reality inversions about the IDF targeting Palestinian children (when, on our planet, Palestinian Arab terrorists go after Jewish children). He travels around giving presentations on “The Case Against Israel.” Not much to agree with there. But look, he’s an Arab who hates Israel. How refreshing, compared to the Jewish idiots that hate Israel, like Max Blumenthal, Philip Weiss or the editorial board and publisher of Ha’aretz! And we do agree that both Bashar al-Assad and the “Free Syrian Army” are vicious criminals. We agree that the PA, Fatah and Hamas are corrupt organizations that screw the Palestinian Arabs. We agree that the New York Times is outrageously biased (although we disagree about the direction it leans). He doesn’t trust the Turkish regime (OK, it’s not anti-Israel enough for him), and he dislikes the House of Saud, its corruption and its international meddling. Me too. What a guy! And he lives right here in Central California, about an hour up the road in Modesto. He’s a tenured Professor of Political Science at California State University, Stanislaus, and a visiting professor at UC Berkeley. He taught at Tufts University, Georgetown University, George Washington University, Colorado College, and Randolph-Macon Woman’s College. He teaches courses in American Government, Comparative Politics: Middle East, Gender & Sexuality in the Middle East, and Politics of the Arab-Israeli Conflict (I can only imagine what this is like). He’s paid — we California residents pay him — to teach our children. It’s impossible for me to be indignant or outraged any more by the behavior of our great universities. Whatever else they may be, they are running sewers of Jew-hatred, reminiscent of Hitler’s academies. I am not exaggerating. The University of Pennsylvania has just completed a 2-day conference on Boycott-Divestment-Sanctions, a nonviolent, progressive approach to dismantling the Jewish state and making possible its very violent end at the hands of its primitive and bloodthirsty enemies. And next week the great Harvard University, not to be outdone, will be the venue for a conference on the ‘one state solution’ (for anyone who doesn’t follow these things, that’s a single Arab-majority state from the river to the sea, and a guaranteed bloodbath). All this is coordinated with Israel Apartheid Week (IAW), the annual festival of false analogies, made-up ‘history’, and post-colonialist moral relativism in which the group that is least advanced culturally gets a pass to be as murderous as it wants, because it’s always hunting season on ‘European colonialists’. In this drama, the Jews, beaten and spit out by Europe and the Arab countries in the 1940s and 1950s, can be given the role of colonials because — unlike the Arabs — they have been successful. These universities are supposedly the best of our best, the super-selective Ivy League schools where our future presidents and corporate leaders are educated. California State University Fresno is not one of the best of the best. Thanks to a bankrupt state, a greedy Board of Regents and administration, and an emphasis on big-time sports to the detriment of academics, it’s a mediocre campus in a mediocre state college system. 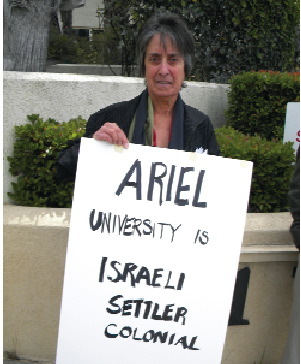 But Dr. Vida Samiian and her Middle East Studies program — although, for them, Israel is not in the ‘Middle East’ — won’t let Apartheid Week go by without getting their licks in. They have invited the renegade Israeli academic and professional liar Ilan Pappé to speak. You can read about Pappé here, but it’s enough to say that his scholarship is a fraud, his smooth exterior a mechanism to hide a pathological hatred of the Jewish state. Dr. Welty responded as expected, hiding his and his university’s moral bankruptcy behind platitudes about academic freedom, free speech, etc. He did not respond to any of the specific concerns in either letter. Pappé will not present “unpopular opinions” (actually, his opinions are quite popular in the academic world) or make statements that some of us “don’t agree with” as Dr. Welty says in his letter. What he will do precisely is to tell lies and incite hatred of the Jewish state in his audience. The ultimate objective of Pappé is to end the state of Israel, which today probably also implies putting a final end to the Jewish people. Pappé himself is of Jewish extraction, of course, which in part has made it possible for him to create a lucrative career as liar, slanderer and hatemonger. There are certainly speakers to whom these universities would not give their platforms. I can’t imagine, for example, that someone would be invited to say that women are inherently intellectually inferior to men. In fact, Lawrence Summers was fired as President of Harvard for making the far milder and probably true statement that women in general have less aptitude for mathematics and engineering than men. If he were on tour presenting even this thesis, how many universities would invite him? Dr. Welty has now done his duty for his mediocre university. Instead of seizing the opportunity to take a courageous stand by denouncing the execrable Pappé, he has brought CSU Fresno down to the moral level of Harvard or Penn. And he didn’t even get $20 million from the Saudis in return. Yesterday I described some of my experiences at one of our community’s recurrent anti-Israel events. It got me thinking about the reasons that we seem to divide into groups according to political criteria, groups that talk past one another. I mentioned that I went to an event sponsored by the local “Center for Nonviolence.” I would very much like to explain to them why I think that the policies they advocate, these basically honest people who would like to improve the world, would result in more violence, not less. But conversations like this are almost impossible. Why is this? When I think back to my days as a philosophy student, one of the philosophers who made the most sense to me was Kant. Kant took very seriously the arguments of Hume and others that the ideas of space, time, causality, etc. — things that allow us to organize and understand our experience — could not be found in our experience itself. But if this is so, how can we know that our systems of knowledge, including science, are reliable? Kant’s answer (very oversimplified!) is that these “modes of perception” — space and time — and “categories of the understanding” — including causality — are built into humans, who then impose them on their otherwise chaotic perception of outside reality. Something like this happens at a higher level, the level at which we assign political significance to events. So a person makes otherwise chaotic human behavior understandable by applying a priori categories and principles to it. The classical Marxist, for example, uses the class struggle as a unifying principle. It enables him to understand and predict, he thinks, the behavior of Barack Obama and Mitt Romney. Today much of the Left holds a postcolonialist worldview, in which the behavior of nations and politicians is explained by relationships of colonial exploitation, present and future. Such conceptual schemes have their utility, but they do not necessarily serve the truth, and can even invert reality when applied inappropriately. My readers are probably tired of hearing me talk ad nauseum about how postcolonial theory inverts reality when applied to the Israeli-Arab conflict. The first reason that I have trouble talking to the people from the Center for Nonviolence (much as I would like to see a reduction of violence in the world) is that we apply different explanatory principles to the same events. This is bad enough, but there’s more. When we read history and today’s news, we not only organize our experience according to a conceptual scheme, we fill in gaps. Things like the motivations of political actors are not always transparent, but they are of great importance in allowing us to predict their future behavior (and isn’t that what knowledge is all about?). So when we process information, we not only organize it, we add to it. What comes out of this is a historical narrative. And narratives about the same events can diverge to the point of being complete opposites. The obvious example of this is the difference between the so-called Israeli and Arab narratives of the events of 1948, in which a real event — the displacement of some Arabs from what is now Israel — is interpreted in entirely different ways by emphasizing some facts and deemphasizing, even ignoring, others, by imputing motivations to the actors, and more. Should we include the parallel displacement of Jews from the Arab world in our understanding? What were the motivations of the Arabs that fled? What did the Zionist leadership intend? What did the Arab leaders want? Which accounts are reliable and which not? The answers to these questions determine a historical narrative. So we have different conceptual schemes and different historical narratives. And even that isn’t all: we live in parallel but different media universes. We visit different websites, watch different TV networks, read different newspapers and magazines, listen to different radio stations. Naturally, we choose the universe that best fits our conception of the way things are. These three reasons are at least part of the explanation for the failures of communication between, for example, a Zionist like me and a member of the Center for Nonviolence. Keep in mind that these differences do not imply that “everyone is equally right” or something similar. Kant thought that despite the fact that humans imposed categories on empirical reality, there was an empirical reality. Propositions can be true or false in a way which may not be entirely objective, but is nevertheless universal. Things are more complicated than they may look, but truth and falsehood, right and wrong, are meaningful concepts. I’ve found that entering the media universe of my political opponents gives me a certain amount of power. I recommend it. But one needs to understand their conceptual schemes as well in order to communicate. Unfortunately, only a few people have the patience to listen to the other side long enough to understand them. 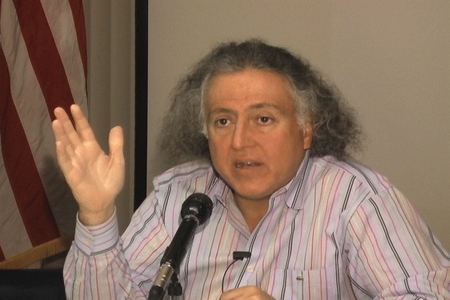 Vida Samiian demonstrates against the presence of Israeli academic Ronen Cohen at a conference of the International Society for Iran Studies in Santa Monica in 2010. Renegade Israeli ‘historian’ Ilan Pappé will be in California next month. In a whirlwind tour, he will visit UCLA and campuses in Northridge, Santa Barbara, San Luis Obispo, and California State University Fresno (CSUF) — where he has been invited by our own Dr. Vida Samiian, Dean of CSUF’s College of Arts and Humanities. The talk will focus on Israeli policy before and after the June 1967 war. Two theses will be argued by revisiting the 1967 events: first, Israeli policies of 1967 can only be understood within the context of the overall Israeli strategy in 1948 and after. This means that the war of 1967 was a direct continuation of the 1948 Nakbah and not a separate event. The second argument will be that Israeli strategy, including the device of what was later named as the “peace process,” was already formulated in 1967 and has not changed since that year and even until today. This strategy, it will be argued in the talk, is the main obstacle to peace in Israel and Palestine. Pappé’s view is that the nakba, the exodus of Arabs from Israel in 1948, was the result of an intentional Israeli policy of ethnic cleansing. In attempting to prove this false thesis in several books and articles, he has presented quotations from Israeli officials of the time out of context, changing or even reversing their meanings (see Efraim Karsh, Fabricating Israeli History (Second, revised edition. London: Frank Cass, 2000)). He is currently under investigation at his present university, Exeter in the UK, for inventing a quotation from Ben Gurion out of whole cloth in one of his books. Now apparently, he wants to place responsibility for the Six Days War on Israel — despite the massive documentation of Arab intentions to destroy Israel and even to commit genocide of its Jewish inhabitants — and present it as another attempt to dispossess the Palestinian Arabs and steal their land. Pappé taught at Haifa University until 2007. He left after a controversy over a student’s Master’s thesis, which alleged that a massacre had been committed in the Arab town of Tantura in 1948. The student, Teddy Katz, ultimately lost a libel suit filed by veterans of the brigade that was accused of the massacre, and a university examination found distortions and fabricated quotes in the thesis and disqualified it. Pappé took up the student’s cause and called for a world-wide academic boycott against Haifa University, which developed into the academic boycott of several Israeli universities by the British Association of University Teachers. The detailed story is here. Pappé continues to claim that there were massacres of Arabs in Tantura, and more recently, Jenin in 2003 — although even the UN now admits that only 50-odd Arabs were killed there, four-fifths of them combatants. This must be based on the twofold recognition that a solution has to include all the Palestinians (in the occupied territories, in exile and inside Israel) and has to be based on the construction of a new regime for the whole land of historical Palestine, offering equality and prosperity for all the people who live there now or were expelled from it by force in the last 63 years of Israel’s existence. This of course would result in an Arab majority, the end of the Jewish state, and probably a bloody civil war. Even by the skewed standards of this field of studies, Pappé’s latest book ranks in a class of its own. Not only does it add no new facts or ideas to the anti-Israel literature, but the sloppiness of its research astounds. It contains countless factual errors and inaccuracies. Yasir Arafat’s birthplace is Cairo and not Jerusalem. The U.N. Special Commission on Palestine (UNSCOP) presented its report on August 31, 1947, not on November 29. Deir Yasin is a village near Jerusalem, and not in Haifa. Lawrence of Arabia had nothing to do with the Anglo-Hashemite correspondence that led to the “Great Arab Revolt” of World War I. Further, this correspondence was initiated by the Hashemites not by the British. Pappé even misspells the official English transliteration of President Weizmann’s first name (Chaim, not Haim). His position is fundamentally dishonest: while he calls himself a ‘historian’, which most of us understand as someone who studies actual past events, he invents events to suit his program. He is not a serious scholar; rather he is a propagandist and ideologue. While such a person may speak at our university, it’s not clear that University funds should pay for it. His talk at California State University Northridge (CSUN) is sponsored by the CSUN Students for Justice in Palestine, CSUN Greens, Muslim Student Association, South Asia Club, and the CSUN Communications Association. Where is the money coming from for his Fresno talk? There is also the question of balance. I understand that he will be speaking alone rather than as a member of a panel. Obviously he prefers this, since any decent historian of the Mideast would make Swiss cheese out of his arguments. But given the political nature of his talk, should not some balance be provided? Finally, is it appropriate for an administrator, like Vida Samiian, to be involved in political activity at the university where she works? After all, Dr. Samiian has the ability to affect the livelihoods of faculty members who might challenge her. I plan to put these questions to the University authorities.